The artist Frans Snyders used the plants, animals, and landscape around his home in Belgium to illustrate this popular fable, creating a group of highly believable creatures in a familiar setting. The spiral tendrils of a grapevine wrap around the tree, allowing a ripening bunch of grapes to hang from the branches. The entire scene takes place out of doors under the branches of a leafy tree. The European Grey Heron substitutes for the crane or stork in Aesop's fable, because the artist preferred to use familiar creatures that lived near his home. A second fox and heron appear to be focused on a shallow bowl or plate lying between them. Across the river, the thin spire of a church steeple topped by a cross pokes above the treetops. The landscape stretches out beyond a grove of trees to show a river and distant hills. 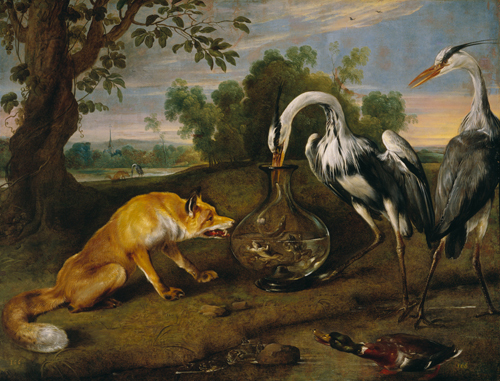 A red fox with a long bushy tail watches hungrily as the heron eats from the jar. Foxes eat a widely diverse diet, and are known for a playful, clever sense of humor. The large, narrow-necked glass jar contains water with live frogs and fish, as well as a long snake-like fish called an eel being slurped up by the heron. The meaning of the numbers 166, or perhaps I66, at the bottom corners of the painting, remains a mystery. Several frogs gather at the edge of the water to watch the action. A green-headed male mallard duck watches the action from the edge of the stream or small pond.